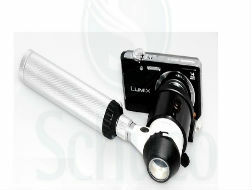 A Dermatoscope is a hand held x 10 skin microscope which illuminates, magnifies and breaks down light refraction to allow a deeper view of suspicious skin lesions, revealing hitherto unseen features. A camera can be attached to the Dermatoscope to record these features. 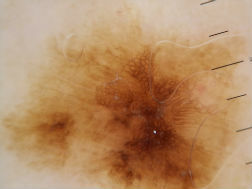 Dermoscopy is therefore a non-invasive diagnostic technique that magnifies the skin in such a way that colour and structure in the epidermis, dermo-epidermal junction, and papillary dermis become visible. This colour and structure cannot be seen with the naked eye. Although many features of suspicious skin lesions can be noted without a visual aid there are some distinctive features of Malignant Melanomas, Basal Cell Carcinomas (BCC’s), and Squamous Cell Carcinomas (SCC’s) that can only be seen with the use of a Dermatoscope. With appropriate training and experience Dermoscopy has been shown to significantly increase the clinical diagnosis of melanocytic, non-melanocytic, benign and malignant skin lesions. The presence (or non presence) of these features as seen with a Dermatoscope has dramatically enhanced our ability to highlight lesions that should be referred on to a Dermatologist for a definitive diagnosis at an earlier stage. Although the appearance of these skin lesions is not common place at our Surgery it is an excellent diagnostic tool to have when required. It is used more extensively at our Surgery on commonly occurring and non sinister lesions where a definitive diagnosis cannot be given with the naked eye.